Born out of the need for a hot cup of soup, Prescription Chicken came about after Val’s nasty bout of laryngitis a few years back. 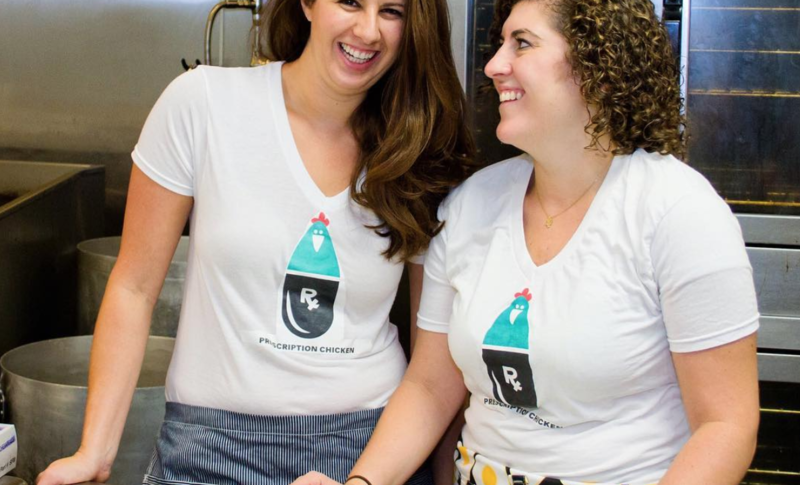 During a family Passover dinner in 2016, she pitched the idea of a matzoh ball soup delivery service to her cousin Taryn and now the duo have brick and mortar locations in two different cities. In addition to being full-time Soup Ladies, Taryn is a master gardener with a full spread of herbs, cucumbers, and tomatoes, while Val has a love of 80’s hair bands and Def Leppard. Since opening at The Bourse, these two Baltimore natives have developed a soft spot for Philly, specifically its food scene, history and the sweet cobblestone streets of Old City. Val and Taryn couldn’t imagine picking their favorite Rx soup — it’s like picking a favorite child — but they would never pass up a bowl of chicken soup. Stop by Prescription Chicken for a bowl of soup and say hi!